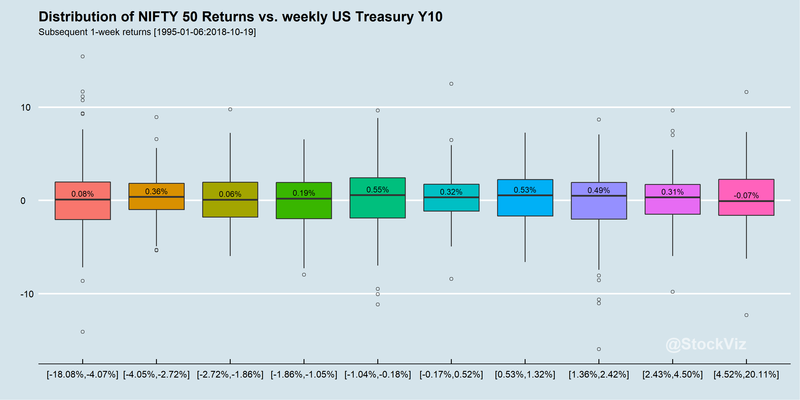 Macro: Is there a relationship between US Treasury and NIFTY 50 returns? 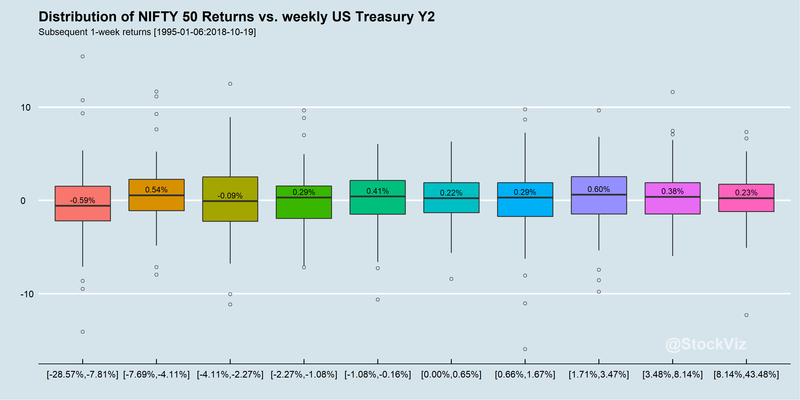 We often hear pundits talk about moves in US treasuries when discussing the NIFTY. Is there a connection? And more importantly, is there a connection that can be exploited? It doesn’t look like there is a link between the two on a weekly basis. Maybe it works in subtler ways (“sentiment”) but it doesn’t look like moves in US Treasuries can be used to trade the NIFTY 50. The FRED publishes the currency indices only on Monday afternoons, or the next business day if they were closed. The dataset uses Friday index values which is Friday New York time. NIFTY would have closed for the weekend a good 24 hours before that. Apart from a few outliers, the approach looks to be good enough. For those who are curious about how this was done, the code is on github. Can global “macro” data be used to model local markets? A series of posts exploring the (lack of) linear relationship between USDINR, OIL and the NIFTY 50. Part I, Part II and Part III. An SVM can be tuned with different parameters. Principal among those is the kernel to be used. Part I looks at the difference in predictive power when different kernels are used to train an SVM over the same dataset. Part II tries to further tune the most promising kernel from Part I – the polynomial kernel. However, we find out that there is no silver bullet. Part IV trains an SVM using the two promising indices and their respective best-performing degree parameters from Part III. An ensemble model that chains the predictions looks promising. While performing the experiments above, we noticed that none of these models side-step the 2018 drawdown. Their principal limitation is that they are “macro.” They will not handle local events well. So we combine the model from Part III with a Simple Moving Average and find that it leads to lower drawdowns in long-short portfolios. 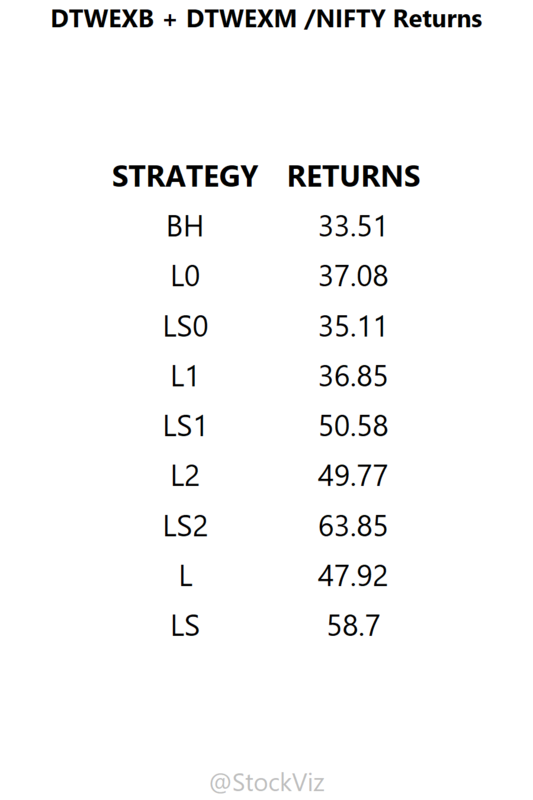 Part V also leads us to conclude that using just one of the indices is sufficient to meet our twin goals of shallower drawdowns and higher long-short returns. Please read Part I and Part II for an introduction. Part III extends the treatment to other dollar indices. Part IV looked at an ensemble model from our learnings from Part III. In this final part of our series on training a simple Support Vector Machine on currency indices to predict the NIFTY, we will incorporate a Simple Moving Average into our decision matrix. While our model in Part IV would go long/long-short based purely on the predictions of the SVM, the model we use here will go long only if both the prediction is positive and the NIFTY is above a 50-day SMA and go short only if both the prediction is negative and the NIFTY is below its 50-day SMA. Think of the SMA as a regime signifier. 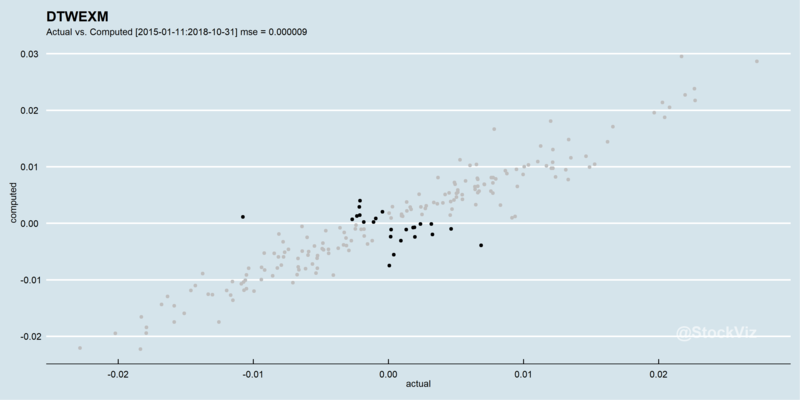 The SVM that is only based on DTWEXM (LS2) give better returns than the one based on the ensemble model (LS.) However, the ensemble model had a slightly lower drawdown of the two. Also, when compared to the earlier version that did not use the SMA, LS2 under-performs by about 10%. However, the key difference is in the drawdowns. 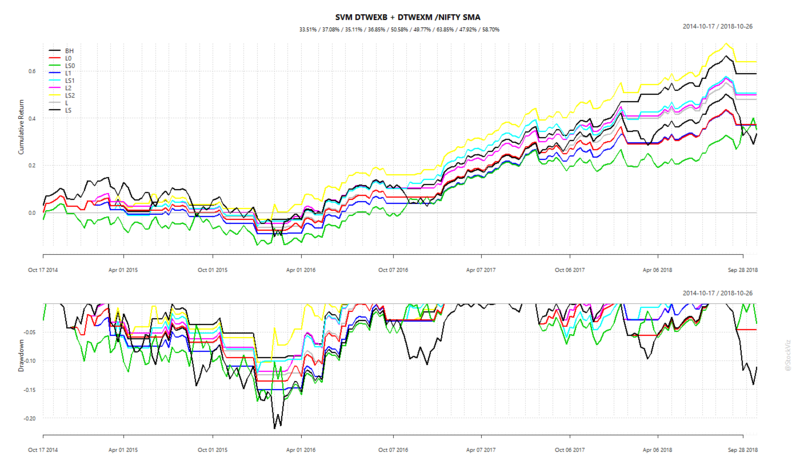 Using the SMA filter reduced drawdowns significantly, especially the one occurring in 2018. An SVM with a 4th degree polynomial over the DTWEXM currency index in conjunction with a 50-day SMA seems to be the winning combination. Please read Part I and Part II for an introduction. Part III extends the treatment to other dollar indices. 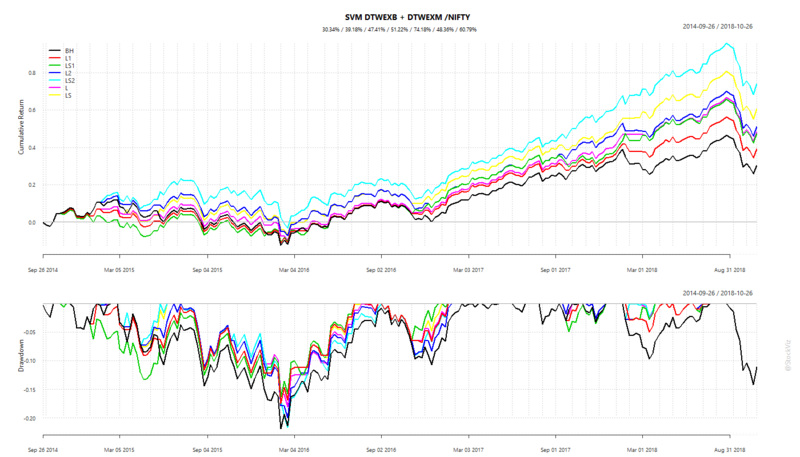 In this part of our ongoing series on using SVMs on dollar indices to predict the NIFTY 50, we create an ensemble of two models. We combine one on DTWEXB, using an 8th degree polynomial kernel and another on DTWEXM, using a 4th degree polynomial kernel, to create long-only and long-short portfolios. In the next (and final) post, we will explore if we can add a simple technical signal into to mix to boost returns and reduce drawdowns.